Transform a peaceful monospace in a aggressive roadster is a strange idea. That is what made the students of Espera Sbarro center in Pontarlier in 1997-1998. Initially was a man, David Bruno, Director General of the SEM, the management company of the most famous and prestigious race in the world: the 24 hours of Le Mans. He wanted Sbarro to present some of his cars for the race in 1998. 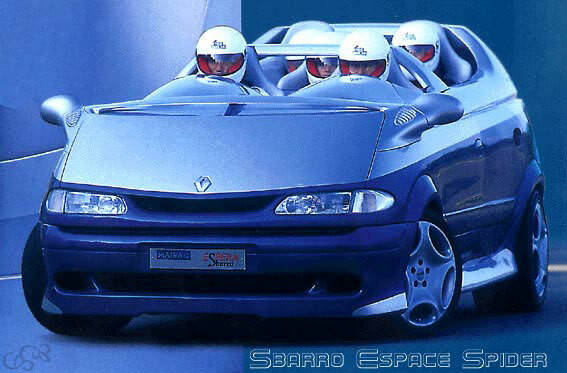 More than a simple exposition, Sbarro think about building a spider on the basis of Renault Espace, offering five places to propose baptisms track to the various personalities and other VIPs invited by the organizers. Matra, which built the Espace for Renault, accepts the offer. It is for this brand to recall its former success during the 24 hours of Le Mans. 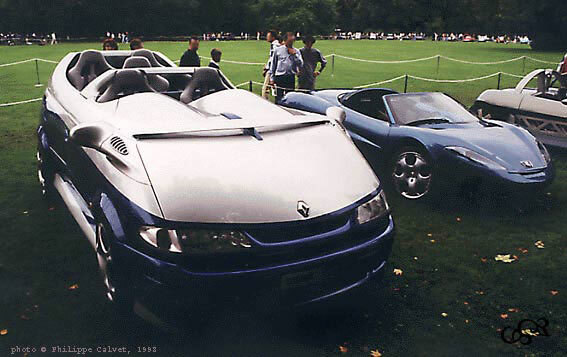 Renault gave its approval: the spider can be in the same vein as the famous Espace F1 powered by a Formula 1 engine. For Sbarro, besides a little bit of nostalgia (he participated in the 24 hours of Le Mans as a mechanic for Ecurie Filipinetti), it has an attractive project to submit to her students, with a nice bonus coverage. In short, everyone is benefiting. About style, Espera students have worked closely with the Bureau de Style de Renault. 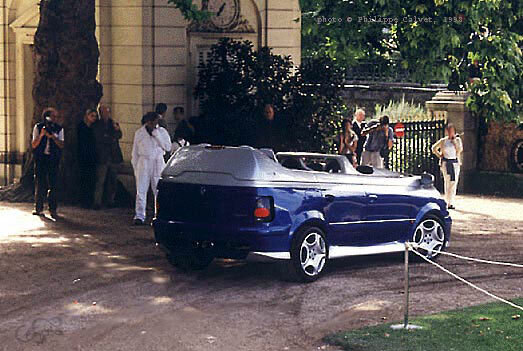 Renault is part of the project, it was necessary for the spider to keep the Espace sytle. 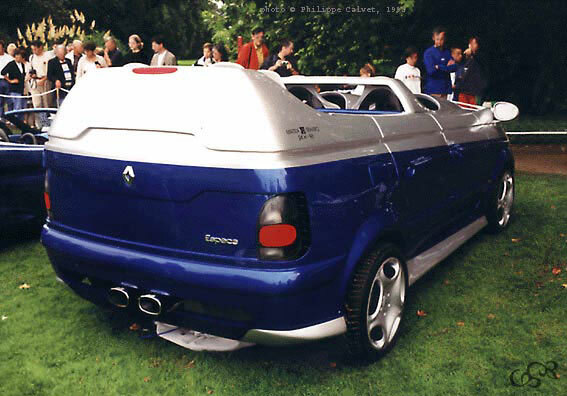 The car is a four-door spyder, offering five places: two at the front in separate cockpits and three at the back ready cloverleaf. 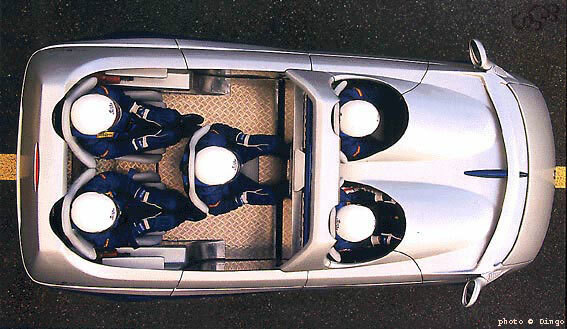 The windshield disappears in favor of a jump-wind that protects driver and passenger, but that expose well the three people sitting in on-elevated position on the back. To mitigate any deformation of the body, many reinforcements have been installed in the car. Small detail: the car was used as the basis for the project came from England, with right-hand drive, as the former race cars ! No Formula 1 engine in Formula 1 as the Espace F1. The car is equipped with the 194 BHP V6 Renault. It was a preview, this motor will be proposed in series a few months later. As on the base model, the spider is a front-wheel drive. The car inherits from an exhaust line that leaves the center of the rear. So, Sbarro and his students have created a spectacular car but not as dramatic as it sounds. Aesthetically it does not leave anyone indifferent (even if the background is a little mass). And mechanically, it is still very wise with its standard engine. His greatest flaw? This is a unique model!